In the world of IT systems monitoring, the terms ‘integration,’ ‘unification,’ ‘end-to-end,’ ‘holistic’…are often misused. Many vendors claim it, but very few, if any, can deliver it. As a result, enterprise customers, analysts and journalists are very skeptical (to put it mildly) about such claims by any tech vendor. The need for an integrated approach to monitoring application performance becomes pretty obvious when you take into account the following factors. In today’s hybrid IT reality, staying on top of application performance is really tough. Today, an ‘application’ is not just the software code sitting on a server, but a very complex combination of multiple services called by the app, data which might be in multiple databases in multiple locations, physical and virtual severs hosted in on-premise data-centers and in the cloud, multiple networks connecting the data and services, intricate application software architectures, and finally end-users accessing the application on many device types from many locations. In this environment, any piece of the puzzle, any flaw in the service—from server failure to issues within the code, a problematic database, network latency or user device compatibility—can slow the application down or cause it to fail completely. So how can IT monitor such a complex application system? It sounds like a nightmare, but is also an opportunity to deliver a solution that can be transformative. It is an attractive problem to solve and it explains why so many vendors try to solve it or misleadingly claim it. In reality, the options offered by most monitoring vendors continue to make matters worse. Part of the problem stems from the fact that IT monitoring capabilities have grown around silos and are driven by the increasing need for more data gathering and analysis by each of the IT domains. Fueled by the massive digital growth of the past decade, the vast majority of large enterprises have accumulated dozens of separate point tools. According to Enterprise Management Associates (EMA), the typical enterprise has between 6 and 10 network monitoring and troubleshooting tools in active use, with even more ‘shelfware’. Furthermore, 10% of large enterprises use more than 25 solutions. We hear from many of our customers that they have some tool consolidation initiative in place. Some have taken it upon themselves to ‘integrate’ the tools by leveraging APIs and creating their own web-based dashboards for some level of visibility unification. This proliferation of monitoring tools has resulted in a very fragmented approach to performance monitoring, with 64% of organizations suffering from it. Without the ability to look at performance in a unified way, without integrated cross-domain visibility and analysis, troubleshooting is inherently inefficient, leading to 50% of IT employee time being wasted on unproductive root cause analysis. So what is the solution to this ineffective way of managing application performance? In order to solve this problem, we have to address the fundamental flaw of fragmented domain visibility. No matter how good the point solutions are in gathering and analyzing domain data, they inherently lack the ability to look at all the components used to deliver applications to end-users as a tightly integrated and interdependent system. Instead, they narrowly monitor the health of each of the components and fail to identify and prevent issues that ultimately ‘fall through the cracks’. These ‘cracks’ are the ‘system’ issues or component interdependencies that are simply not visible to domain tools. Captures data from the entire hybrid ‘system’ that is delivering the application, cost-effectively and comprehensively. This means high definition, continuous data capture from all infrastructure components, all networks, all application servers and databases, all users, all the time. Provides highly tailored, role specific performance visibility to all stakeholders and domain experts without sacrificing granularity and depth of analysis. Allows and encourages collaboration between IT teams by providing seamless access to complementary performance metrics, making troubleshooting dramatically easier. 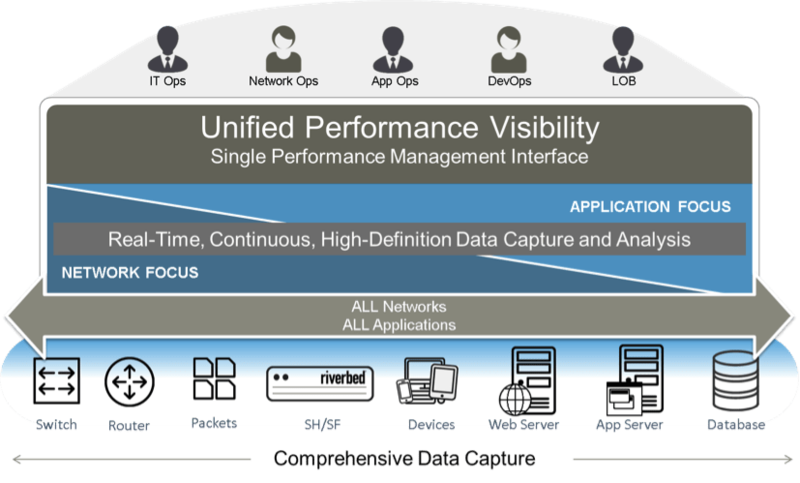 Provides Unified Performance Visibility for applications via a single performance management interface that automatically, blends, correlates and calibrates all data from all the monitored components. The New SteelCentral Platform is the ONLY solution in the market that can deliver these capabilities. We hope that you come to our free webinar on November 18th and learn more about these capabilities (Click here to register). The new SteelCentral Platform enhancements bring major advances in collaborative troubleshooting capabilities. While new features are being released in key components of the platform—Portal, AppInternals, AppResponse, NetAuditor, NetShark, NetPlanner and NetSensor—the enhancements support a common theme of improved platform integration. They also enhance several powerful capabilities, including expanded network and application visibility; superior end-to-end application transaction monitoring; and more cost-effective Web application and WAN-optimization monitoring. architecture allows enterprises to implement components as needs arise. Expanded network and application visibility. The enhancements to SteelCentral bring major advances in collaborative troubleshooting capabilities, with visibility into the actual physical application network path integrated with existing logical network and application maps. IT staff can quickly move between operational views of applications and networks, so they can eliminate the usual finger-pointing between application and network teams, zeroing in on the problem areas and enabling teams to quickly and precisely identify the root cause. Additionally, packet storage on NetShark has been expanded to 576 TB to enable deeper forensics. This is especially useful in high-volume networks, particularly those focused on security or compliance requirements that are key for government, financial services, or healthcare organizations. More cost-effective Web application and WAN-optimization monitoring. Today, hybrid IT environments have become the new norm, and companies are increasingly using Riverbed SteelHead to optimize application delivery, regardless whether the apps are running on-premise, in virtual environments, or in the cloud. Enhancements to SteelCentral bring enhanced visibility and control for SteelHead environments, enabling customers to monitor the status of SteelHead EX and SteelHead Interceptor devices as a part of their overall infrastructure. In addition, SteelCentral is delivering improved performance for end-user experience monitoring of SteelHead-optimized web and SaaS applications such as Salesforce.com.